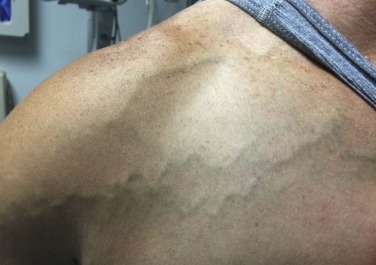 Prominent superficial veins over the right upper arm and shoulder, reflective of Urschel’s sign. A 32-year-old man, employed as a deckhand, was referred for right upper extremity swelling and pain of 3 months’ duration. Physical examination revealed swelling of the right upper extremity and prominent superficial veins over the right upper arm and shoulder (Urschel’s sign; Figure). Blood work including thrombophilia screen was unremarkable. Right upper extremity venous duplex ultrasonography and computed tomography venogram showed occlusion of the proximal right subclavian vein. Dynamic computed tomography with right arm abduction confirmed venous thoracic outlet syndrome. He underwent first rib resection. Peripheral venoplasty was attempted but failed owing to chronic thrombosis and fibrotic changes in the vessel. He was started on anticoagulation and was subsequently referred to vascular surgery for venous bypass evaluation. His long-term therapy included continued anticoagulation and compression sleeve therapy, as well as less physically demanding duties at work. Axillary–subclavian vein thrombosis resulting from repetitive, strenuous upper extremity activity is known as effort thrombosis or Paget Schroetter syndrome. Physical examination finding of associated dilated superficial venous collaterals over the shoulder and upper arm is known as Urschel’s sign. A relatively uncommon disorder, it is of interest to the general physician because it still represents the most common vascular disorder of the professional, collegiate, or high school athlete. It most typically occurs in young and otherwise healthy males. In our patient this condition was most likely the result of the repetitive overhead movements required by his occupation. Early thoracic outlet decompression and catheter-directed thrombolysis are key to improving outcomes in Paget Schroetter syndrome.